Before the settings in this section will work you must make sure your webserver is currently running. See Webserver. Most users will find it easier to request mSupply support to set this up for you. have an appropriate SSL Certificate set up. Sustainable Solutions can help with this if needed. the URL that users type in to the address bar of their browser to access the dashboard will be this with Dashboard on the end e.g. http://dashboard.msupply.org:2048/dashboard. Tick the reports in the Is active column to select them for display on your dashboard. You can choose how often these reports are updated by clicking in the Update Period (mins) column and entering a number of minutes. 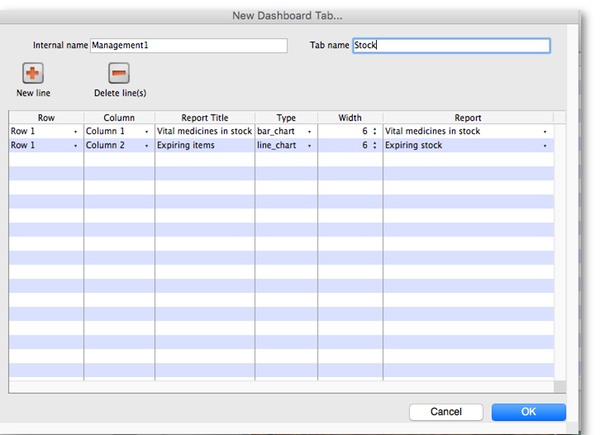 Setup which reports appear on which tabs - refer Dashboard tabs. Setup Email Notifications for reports - this feature allows for reports to be emailed on a schedule to a user or group of users. Multiple reports for a User will appear on different tabs of an excel workbook. Note - this needs to be configured at our end, so get in touch if you're interested and we'll set this up for you. If there are any properties shown in the list, these can be edited to change what is displayed. To edit a property or value, click once to select the row, and then click again in the appropriate cell to edit it. To add or delete a row use the New line and Delete line(s) buttons at the top of the window. In the example shown in the screenshot above (a map report), the coordinates of two of the map corners and the item code of the item whose stocks will be shown on the map have been entered. Note that if you add extra properties to the default reports they'll be ignored. See the section below for details of the various dashboard reports available and the settings that can be edited. customisation allows for a client customisation: currently supports MAM for the MAM specific changes. If you can't make a dashboard report that does what you want then please speak to us, it's usually a fairly simple matter for us to create one for you. Now you add reports that will show on this tab. Column: The column within the row- set to “1” if you don't have multiple reports on this row. 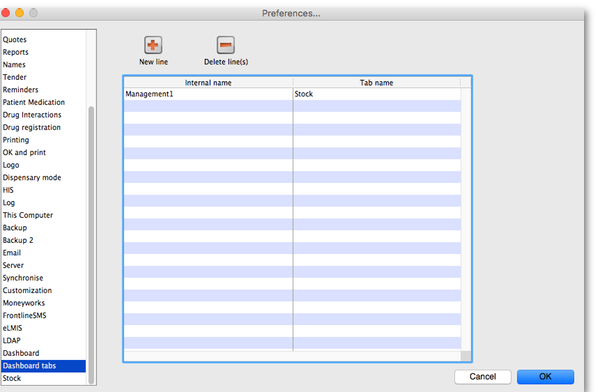 This is the final step in setting up dashboards: once the tabs have been setup you have to choose which users will see which tabs. You do this in individual users' settings. See managing users for instructions on how to do this.